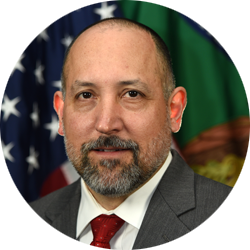 Patrick Hernandez joined the United States Mint in February 2019 to serve as Chief Administrative Officer. Prior to assuming this position, Patrick was a Deputy Assistant Administrator for the Department of Homeland Security/Federal Emergency Management Agency (FEMA) in charge of the Field Operations Directorate. In this capacity, he was responsible for development and maintenance of the infrastructure and critical delivery systems required to educate, train, develop, manage, and deploy over 16,000 people in FEMA’s Incident Workforce and three National Type I Incident Management Assistance Teams to support State, Local, Tribal, and Territorial disaster survivors and first responders nationwide. In addition, while serving at FEMA, Patrick deployed to numerous disasters to lead incident response operations – most notably the 2011 Jefferson County, Alabama Tornadoes, the 2012 Staten Island, New York Super-Storm Hurricane Sandy, the 2017 Puerto Rico Hurricane Maria, and the 2018 Bay County, Florida Hurricane Michael. Prior to joining FEMA, Patrick had the privilege of leading Marines as a commissioned officer in the United States Marine Corps where he retired in 2010.